(2011) "Blow Your House Down"
"I Will Follow" is a song by rock band U2. It is the opening track from their debut album, Boy, and it was released as the album's second single, in October 1980. Bono wrote the lyrics to "I Will Follow" in tribute to his mother who died when he was 14 years old. "I Will Follow" is the only song that U2 have performed on every tour since they released their first album. The song was U2's first music video, directed by Meiert Avis in Dublin, Ireland. The song was issued five times, first in 1981 on a 7" vinyl in Ireland, the United Kingdom, Australia, and New Zealand, second on the same format in the United States and Canada, third in the Netherlands in 1982 with a track from 1981's October, in 1983 with a live version of the song, and finally in 2011 with a live version of the song recorded at the 2011 Glastonbury Festival. 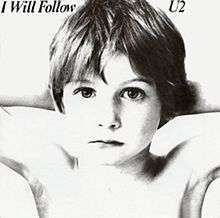 "I Will Follow" was written three weeks before U2 began recording Boy. U2 singer Bono has said that he wrote the song from his mother's perspective and that it was about the unconditional love a mother has for her child. His mother died following her own father's funeral when Bono was fourteen, which the singer says plunged him into emotional turmoil for the next few years. In the recording of the song for the Boy album, its producer Steve Lillywhite plays a glockenspiel. Edge has acknowledged John McGeogh as an influence on his early sound; the guitar line on this tune evokes comparison to Magazine's "Because You're Frightened." "I Will Follow" had a second single release as a live version in the Netherlands and Germany in 1982, and a third release in the U.S., lifted from the Under a Blood Red Sky album, in 1983. It appeared on both the compilation album and video collection The Best of 1980-1990, and in some countries, on the U218 Singles compilation. The song is included in the 2015 music video game Rock Band 4 as a playable track. It is the band's most frequently performed song with over 800 performances. It has been performed at every concert of The Joshua Tree, PopMart Tour and the Innocence + Experience Tour  It has been played extensively on every tour with the exception of the Zoo TV Tour, where it was performed infrequently, and was part of the acoustic set, and the U2 360° Tour, where it wasn't played until the third leg. The song appears on the live recordings/films Under a Blood Red Sky, U2 Live at Red Rocks: Under a Blood Red Sky, Live from the Point Depot, PopMart: Live from Mexico City, Elevation 2001: Live from Boston, Live from Boston 1981, Live from Paris, and U22. It also appears on Vertigo 05: Live from Milan, the bonus DVD that is included with the U218 Singles compilation and as a bonus track for UK/Australia releases of the CD. U2 performed the song on the BBC2 television show The Old Grey Whistle Test in 1981. The performance was later released on DVD on a compilation of performances from the show. In 2005, Blender ranked the song at number 214 on its list "The 500 Greatest Songs Since You Were Born". The magazine wrote, "The first song on U2's first album introduced the guitar sound that would define their work. [...] The arena-ready clarion call also established Bono's trademark lyrical earnestness, one of the reasons the song remains a fan favorite and a staple of the band's recent tours." The Netherlands release was recorded for the Veronica TV concert series Countdown, and was reissued in Germany in 1983. The cover of the Canadian and U.S. releases feature the same image as the North American release of Boy. The 1983 release was in a generic red sleeve with no cover artwork. ↑ Sams, Aaron; Kantas, Harry. "U2 – "I Will Follow" Single". U2songs.com. Retrieved 24 October 2016. ↑ "Bono in San Antonio". U2 Magazine No. 3. May 1, 1982. Retrieved 2007-11-06. ↑ Stokes, Niall (1996). Into The Heart: The Stories Behind Every U2 Song. Harper Collins Publishers. p. 9. ISBN 0-7322-6036-1. ↑ Graham, Bill; van Oosten de Boer (2004). U2: The Complete Guide to their Music. London: Omnibus Press. p. 8. ISBN 0-7119-9886-8. ↑ Snider, Mike (September 28, 2015). "'Rock Band 4' gets U2 as music video game rivalry reboots". USA Today. Gannett Company. Retrieved September 28, 2015. ↑ "I Will Follow Performances". Retrieved 2007-11-05. ↑ The Old Grey Whistle Test (DVD). Warner Home Video. 2003. ↑ "The 500 Greatest Songs Since You Were Born". Blender (41). October 2005. Archived from the original on December 28, 2010. Retrieved 2010-07-02. ↑ "U2 - Chart History". Billboard. Retrieved 6 February 2014.